Make Sure Your Clients Choose You Over Your Competition! Do you have what it takes to make sure your clients choose you over your competition? Order them a copy of The Bar Starts Here and put the power of operating a successful bar, literally in the palms of their hands. This Holy Grail Book of Business for Bars is a one of a kind Interactive “How To Guide” that comes with over 500 pages of Operational Tools, Training Manuals, and Guides, that your clients get to download & customize as your own. 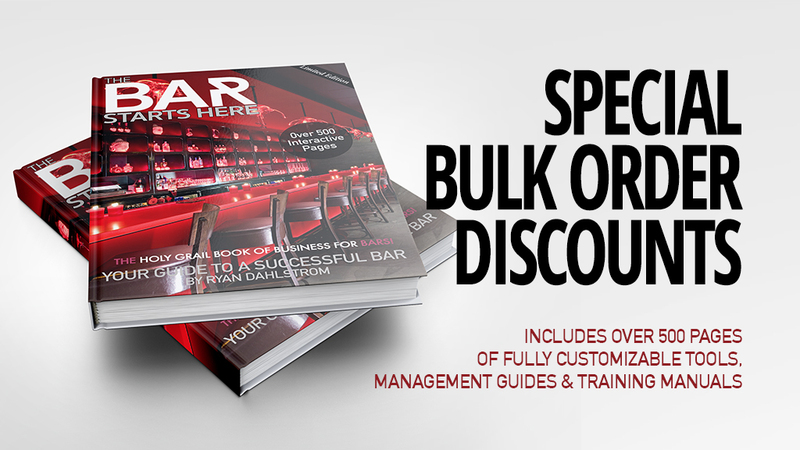 For a very limited time, I am offering incredible Bulk Order Discounts for The Bar Starts Here and can customize every single manual and guide, to include your product information and brand placement. Take your engagement with your client’s even one step further and get your bulk order Custom Printed with your brand or product featured on the back cover of the book. I can even custom print your own unique Download Key directing your clients go to your website to unlock their 500+ pages of manuals, guides and tools that comes with every copy of The Bar Starts Here. Don’t just sell to your clients, invest in their future with The Bar Starts Here and Put The Power of Operating a Successful Bar, Literally in the Palms of their Hands. I have distributed over 65,000 manuals and guides to industry professionals located around the entire world. The Bar Starts Here is a perfect gift Staff Members and Industry Clients. Contact me today for Bulk Order Discounts. We gladly accept Master Card, Visa, American Express and Discovery. Get 24 hour access to the some of the best Bar Experts in the industry.